Lee Kuan Yew: How did Asia remember him? "Anyone who thinks he is a statesman ought to see a psychiatrist." That comment, from Lee Kuan Yew, the most quotable of Asian leaders, must have been made with his tongue at least partly in his cheek. His exceptionally long tenure on the diplomatic stage, his brilliant intellect and ruthless pragmatism earned Lee the accolade of "statesman" from more world leaders than any other personality in the Asia Pacific region. But what about closer to home, in South East Asia? There, Lee Kuan Yew's image is more complex. "Some countries are born independent. Some achieve independence. Singapore had independence thrust upon it," he wrote in 1998. When Singapore was expelled from Malaysia in 1965, Lee Kuan Yew was pessimistic about its prospects. He was acutely conscious of its vulnerability, a small, largely Chinese island-state sandwiched between two much larger Muslim countries, Malaysia and Indonesia, both of which were hostile. He was also worried about the consequences of American reverses in Vietnam. A self-professed Machiavellian, Lee believed raw power determined the fate of nations, and Singapore had little. He wanted the might of the US to anchor his country, but expected its Soviet rival to challenge this in Asia. Early on, he anticipated the rise of China, which, he believed, would inevitably view South East Asia as its own backyard. So the formation of Asean (the Association of South East Asian Nations) in 1967, at the prompting of the then-Thai and Indonesian foreign ministers, was initially regarded with some scepticism by the Singaporean leader, although he also saw that it was essential his country play a leading role, in the hope of advancing Singapore's acceptance as an equal player in the region. Lingering disputes over territorial waters and many other issues continued to dog relations with Indonesia and Malaysia for several years. There were also differences between Singapore and its neighbours over a Malaysian proposal to establish a zone of neutrality in Asean, which would have required an end to all foreign bases. Lee wished to preserve his country's close military ties with the US. But with his first visit to Indonesia under President Suharto in 1973, Lee Kuan Yew showed one of his abilities to great effect: to build strong working relationships with other South East Asian leaders. He was quick to understand the enigmatic Indonesian general, and establish a pragmatic, trusting rapport with him, which lasted until Suharto's death in 2008. He was later able to form a similar, though less warm and trusting, relationship with long-standing Malaysian Prime Minister Mahathir Mohammad, whom he recognised as a man who, for all of his animosity towards the Chinese of Singapore, shared Lee's ambition to move his country forward. They also both rejected Western criticism of their approach to human rights in the 1990s, leading to the vaguely articulated notion of "Asian values", which prioritised stability and economic progress over individual freedoms. His other great contribution to Asean was as interlocutor with the rest of the world, in particular the US and China. His clear-headed strategic views influenced a succession of US presidents and officials, in particular the Cold War Secretaries of State Henry Kissinger and George Shultz. He made a ground-breaking visit to China in 1976, when the rest of Asean was still deeply suspicious of Beijing's role in sponsoring insurgencies, and received Deng Xiaoping in Singapore two years later, as he led his country out of its international isolation in the late 1970s. The new Chinese leader was fascinated by Singapore's blend of authoritarian rule and entrepreneurial success, and Lee used his ties with China to persuade it to take a more conciliatory approach towards South East Asia. More than anyone else, he was able to articulate Asean's concerns to the great powers - in his view, "to ensure its interests were taken into account". As Jusuf Wanandi, one of the architects of Suharto's pragmatic New Order wrote following the Singaporean's death: "Lee, with his sharp thinking, especially on the future of East Asia and Asia Pacific, had become the spokesperson for the region, in particular to the West, and that was indeed an important role for him to play. And regarding the future strategic development of the region, no one can replace him." It was however the US defeat in Vietnam in 1975, and then the Vietnamese invasion of Cambodia in late 1978, that compelled Asean to elevate itself to more than just a talking-shop for easing internal disputes and building trust, which is largely what it was until 1975. Lee Kuan Yew now played a central role in constructing a more robust Asean architecture. First, because of his conviction that political stability came out of economic progress, he took every opportunity to promote trade within Asean, raising the idea of a free trade area as early as 1973. This suited Singapore, which had pinned its survival on having one of the world's freest trade and investment regimes, but it proved far more difficult to overcome the suspicion and vested interests of neighbouring countries. The Asean Free Trade Area finally came into effect only in 1994. Second, with his conviction that Asean could never be militarily strong or cohesive enough to provide for its own security unaided, he pushed for a framework that would keep the superpowers engaged and in dialogue with the region. This eventually gave rise in the 1990s to the Asean Regional Forum, a unique, annual gathering that brings together the foreign ministers of China, the United States, Russia, Japan, the European Union, North and South Korea, among others, to hammer out international security issues. "You cannot replace the reality of power by just talk," he said in 1993. "You may diminish suspicions and fears - and that is a very great achievement." 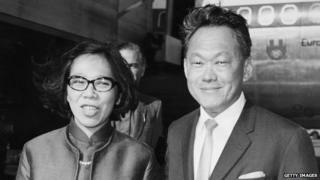 Blunt-spoken and stubborn in his convictions, Lee was not always able to overcome differences with his Asean partners. Indonesia and Malaysia were uneasy about his rapprochement with China, although he did give a private assurance that Singapore would not normalise relations with Beijing until Indonesia did, and honoured that promise. Likewise, he worried about those two countries' approaches to Vietnam during the stand-off over Cambodia in the 1980s, fearing that the Soviet-backed Vietnamese would undermine Asean unity. He harboured no long-term enmity towards Communist Vietnam, he said, but stuck to the principle that invading other countries was unacceptable. The Vietnamese seemed to accept that explanation, honouring Lee with the role of an official economic advisor in 1992 after the Cambodia issue was settled. In later years some of Lee's outspoken comments about his neighbours continued to cause friction. Relations with Indonesian Presidents BJ Habibie and Abdurrahman Wahid were frosty after he cast doubt on their leadership abilities. His continued criticism of the pro-Malay Bumiputera policy in Malaysia sparked a war of words with Dr Mahathir. He viewed Thailand as a capricious and unreliable partner. As he often said, he cared little whether he was liked or not. But the eulogies to Lee Kuan Yew from neighbouring countries are not insincere. He played an outsize role in building the stability and prosperity of this region, and will long be remembered for that.